Okah Tubbee, b. 1810 or 11 and Rev. L. L. Allen (Lewis Leonidas). A Thrilling Sketch of the Life of the Distinguished Chief Okah Tubbee Alias, Wm. Chubbee, Son of the Head Chief, Mosholeh Tubbee, of the Choctaw Nation of Indians. A Thrilling Sketch of the Life of the Distinguished Chief Okah Tubbee Alias, Wm. 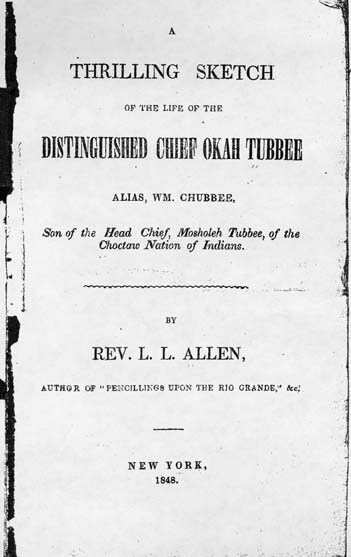 Chubbee, Son of the Head Chief, Mosholeh Tubbee, of the Choctaw Nation of Indians.